He has traded in his suits and ties for a robe of white. 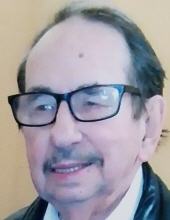 Edwin “Ed” Fleshman was born November 4, 1931 and was loaned to us until April 2, 2019. He was the baby of 10 surviving children of Claude and Lina Fleshman, of Turlock California. He was a patriot who served in the US Army at the end of WWll and in the Navy during the Korean War on the battleship, USS New Jersey. After returning from the war he met and married Bobbie Joyce Rentfrow in 1955. He was the proud father of 3 daughters and 1 son. Together, he and Joyce worked in the ministry throughout the Bay Area (San Jose and Santa Cruz) and in 1977 surrendered to the calling of becoming a Pastor. They left San Jose for Riverside, CA to attend seminary. He was called to his first church in 1979, Magnolia Ave Baptist Church in Long Beach. In 1983, with his wife and 2 youngest children in tow, the family moved to a new church in Klamath, CA (eventually becoming Northside Baptist church). It was with this fellowship of believers that he would spend the rest of his pastoral career, retiring in 2015 at the age of 84. January 2011 God called his wife Joyce home and in 2013 he married Martha Fischer. Once he retired, he and Martha became part of the family at the Nazarene Church in Crescent city. During his time on the North Coast he kept himself busy with all the things that come along with the ministry as well as community involvement. He was the voice of Paul Bunyon at the Trees of Mystery, a Chaplain for the VFW, and a Front End Manager for Kmart. He loved his community and visiting with them even still hand delivering his bills just to drop in and say “Hi” with a smile and a piece of candy. He was devoted to his children, grandchildren and great grandchildren as well as any other “children” who came along. He was an amazing husband and father, grandfather and friend. But most importantly, he was an amazing man of God. We are truly humbled that God chose us to share his life. He was preceded in death by his parents, Claude and Lina, all 11 of his siblings, His Wife Joyce and his oldest daughter Micki Lowe. He is survived by his children Alyce (Patrick) Pearson, Nicole (Jeff) Stout and Edwin (Heidi) Fleshman all of Crescent City as well as son in law Gary Lowe of Temecula, CA. His grandchildren, Matthew Hurley, Joshua (Josie) Hurley, Adam Hurley, Alex (Mikala) Pearson, Sarah (Ben) Ochoa, David (Kristina) Norberry (Stout), Rebekah Stout, Mateo (Angelina) Stout, Mikayla Fleshman and Micah (Bridget) Lowe. Several great grandchildren and many nieces and nephews. The family invites you to a fellowship at the home of his daughter, 151 Cooke Street immediately following the burial services. Lord we thank you for the Testimony of this man, may it continue on through the lives of those he touched. Well done, our good and faithful Daddy. To plant a tree in memory of Edwin Oliver Fleshman, please visit our Tribute Store. "Email Address" would like to share the life celebration of Edwin Oliver Fleshman. Click on the "link" to go to share a favorite memory or leave a condolence message for the family.